A new window into the nature of the universe may be possible with a device proposed by scientists at the University of Nevada, Reno and Stanford University that would detect elusive gravity waves from the other end of the cosmos. Their paper describing the device and process was published in the prestigious physics journal Physical Review Letters. Andrew Geraci, assistant professor in the University of Nevada, Reno physics department, demonstrates an apparatus that is of part of an experiment that uses similar technology to his gravitational wave detector. This equipment uses levitated nanospheres in an optical trap for investigations of the gravitational force at the micron length scale, where some theories in high-energy physics predicts there will be a deviation from the Newtonian inverse square law of gravitation. Credit: Mike Wolterbeek, University of Nevada, Reno. A new window into the nature of the universe may be possible with a device proposed by scientists at the University of Nevada, Reno and Stanford University that would detect elusive gravity waves from the other end of the cosmos. Their paper describing the device and process was published in the prestigious physics journal Physical Review Letters. "Gravitational waves represent one of the missing pieces of Einstein's theory of general relativity," Andrew Geraci, University of Nevada, Reno physics assistant professor, said. "While there is a global effort already out there to find gravitational waves, our proposed method is an alternate approach with greater sensitivity in a significantly smaller device. "Our detector is complementary to existing gravitational wave detectors, in that it is more sensitive to sources in a higher frequency band, so we could see signals that other detectors might potentially miss." 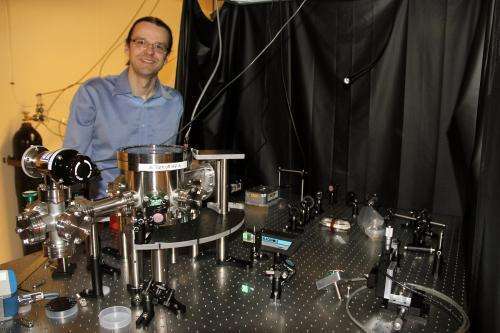 Geraci and his colleague Asimina Arvanitaki, a post-doctoral fellow in the physics department at Stanford University, propose using a small, laser-cooled, tunable sensor that "floats" in an optical cavity so it is not affected by friction. Geraci is seeking funding to begin building a small prototype in the next year. "Gravity waves propagate from the remote corners of our universe, they stretch and squeeze the fabric of space-time," Geraci said. "A passing gravity wave changes the physically measured distance between two test masses – small discs or spheres. In our approach, such a mass experiences minimal friction and therefore is very sensitive to small forces." While indirect evidence for gravity waves was obtained by studying the changing orbital period of a neutron star binary, resulting in the 1993 Nobel Prize in Physics, gravity waves have yet to be directly observed. "Directly detecting gravitational waves from astrophysical sources enables a new type of astronomy, which can give us "pictures" of the sky analogous to what we have by using telescopes," Geraci said. "In this way the invention of a gravitational wave detector, which lets us "see" the universe through gravity waves, is analogous to the invention of the telescope, which let us see the universe using light. Having such detectors will allow us to learn more about astrophysical objects in our universe, such as black holes." The approach the authors describe can exceed the sensitivity of next-generation gravitational wave observatories by up to an order of magnitude in the frequency range of 50 to 300 kilohertz. Their paper, "Detecting high-frequency gravitational waves with optically levitated sensors," appeared in Physical Review Letters, a publication of the physics organization American Physical Society. Geraci also presented his research at the annual American Physical Society Meeting in Denver in April. The meeting is attended by particle physicists, nuclear physicists and astrophysicists to share new research results and insights. Vacuum mechanics doesn't explain it. Even after posting that gobbledegook ad infinitum / ad nausium. Suppose this is a wave..OF...spacetime and spacetime therefore is the carrier. We know space is not empty, therefore speeds approaching lightspeed may be prohibited by friction drag forces well before any theory of Einstein. However since spacetime is by theory compressible and rarefactable like sound waves and newtonian gas laws, herein lies the workaround. Our visitors appear to be able to use this method, and maybe this device will give other dividends that SETI would love to use. In AWT the gravitational waves manifest itself with notoriously known CMBR noise, which everyone can detect with analogue TV set. As Eddington pointed out already before many years, gravitational waves do not have a unique speed of propagation. The speed of the alleged waves is coordinate dependent. A different set of coordinates yields a different speed of propagation and such a waves would propagate like the noise. "Geraci is seeking funding to begin building a small prototype in the next year." Just as the null result of Michelson-Morley put an end to ether theories so will the null result of gravitational waves put GR to rest. The null result of Michelson-Morley experiment can be derived easily just from Maxwell's aether theory of light (as Feynman did it routinely during his lectures). How is it possible, just the experimental result predicted with aether model served for dismissal of aether model? Well, easily: the Maxwell's theory is based on transverse light wave spreading model, where the aether is FORMING the space, but the dismissal of aether with M-M experiment was based on assumption, that the aether is sparse gas FILLING the space, in which the energy is spreading in longitudinal waves. If you confuse transverse waves with longitudinal ones, then you cannot never get into correct interpretation of experimental result. BTW We already know, that the M-M experiment is violated with CMBR anisotropy, because the longitudinal (gravitational) waves manifest itself just with CMBR noise in dense aether model. The sparse aether model could never work, because such an aether cannot serve as a luminiferous aether: not only it does enable only longitudinal wave spreading - whereas the light waves are transverse, as we know from the time of Hertz experiments with polarization of EM waves. But in addition such an sparse aether is too weak for being able to mediate the energetic forms of radiation, like the X-ray and gamma rays, because the energy density of radiation can be never higher than the mass density of environment, which is mediating it. I will repeat these simple connections, until all people on the world will learn them. The mindless parroting of textbooks is counterproductive here. must be detected with accelerometers. Gravitatinal waves can be generated and detected in a lab. Several things come to mind. adv-LIGO should be embarrassed: All of the photonic technology for this expt. has been around for ~ 20 yrs, thus w/its enhanced sensitivity, direct detection of grav waves could have occurred years ago, without the Billion$$ spent on LIGO. Also, Pulsar Timing Arrays have been projected to uncover Existing evidence for grav waves from their data NLT 2016 ! Thus the search for grav waves is turning into a 3-horse race for the finish line. How is it that these guys expect to get funding to detect gravity waves, when the relatively simple experiments that would prove gravity (as defined by f=gMm/RR) does not exist are always refused funding? By the way, if PhineasFogg is reading this, can I remind you of your promise to rate my book either 1 or 5 depending on the LIGO results? Einstein's space-time concept has been mathematically, theoretically & experimentally proved baseless and General Theory of Relativity & Black Hole concept also have been proved baseless by Stephen Crothers in the published articles inď�� peer-reviewed journal-Refer Stephen Crothers web-site. Crothers was indeed peer reviewed, all his peers are other cranks. Stephen Crothers was booted out his graduate program because he was disruptive to his classmates, and put great effort into attempting to sabotage the work & research of his professors & supervisors. He was given the golden opportunity to study under one of the truly great astrophysicists of the 20th century, Paul Davies, and threw it away. Yap.... good to be back.